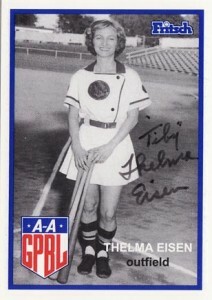 NEIBA Hall of Famer (2006) and former Fort Wayne Daisies player, Thelma “Tiby” Eisen, passed away on May 11, 2014 on her 92nd birthday. She played professional baseball from 1944 to 1952. She lived in Santa Monica, Palm Springs, and Pacific Palisades, CA for her 92 years. Tiby was a centerfielder with great speed and a solid bat. She was an All-Star several times and managed the Peoria Redwings briefly in 1947. No services will be held as she will be cremated.